Sometimes I can’t find enough time to read the pile of “must reads” on my night stand. So I am careful to suggest that others add to their guilt (I might be projecting my own guilt!) by having even more book and article suggestions to tack on to their lists. When I make time to read, however, I am able to set aside the events of the day and the many distractions from people and electronics and something amazing starts to happen. Ideas and thoughts seem to flow in a torrent! I hope you’re able to spark your learning in a similar fashion. Find the time. It reduces stress and allows you to chew on the problems of the day in a new and productive way. And as a CEO or business leader, you don’t have to read all business books to find inspiration. This year, the trend (Fortune & LA Times for example) is for CEOs to read non business books to inspire new ideas. So whether you’re committing to regular reading or simply looking for something to do on that family camping trip or week at the beach, this August I have a few page turners to consider. Choose Yourself by James Altucher: James is an avid writer, blogger and many time entrepreneur. Choose Yourself defines today’s workplace realities and offers real world ideas on how to take control of your work and how you will forever define how you earn an income. Thought provoking! In the Kingdom of Ice: The Grand and Terrible Polar Voyage of the USS Jeannette, by Hampton Sides: This one grips you! A few weeks ago, I spent a week ignoring friends and family on the beach in Block Island and read this one. It’s a true story researched for years by Hampton, Outside Magazine and others. This is the greatest historical story you don’t know! Great lessons in leadership, sacrifice, and survival. Imagine trying to get to the North Pole in a wooden ship with no means of communication with the outside world! Delivering Happiness A Path to Profits, Passion, and Purpose by Tony Hsieh, CEO Zappos.com. In a business world where few have any real meaningful, sustainable business advantage, Delivering Happiness chronicles the dramatic rise of Zappos and how their culture drives everything and defines their success. And it is an entertaining read to boot! Not every success is immediate and over night. Success takes time, risk and perseverance. I am always scanning for the next must read, I hear the Uncontainable, The Story of the Container Store by Kip Tindell is a must read… Next on the list? What books are on your list? Share away! Are You a Sharing Leader? Today’s world is about information. That’s why it’s called the Information Age. Why not empower today’s knowledge worker with as much as possible? Why not make it a point to share as much as you can? A group perspective is often more right and more powerful than the views of a handful or the privileged. Be clear on what their role is as a leader. Is it your job to share what you hear and learn in terms of strategy, vision, or simple business updates with your team? If you’re hearing these messages and you don’t see them in newsletter, town halls, or email updates then I bet it is part of your role. Be a messenger. There is good power in doing this well! Share it all. Don’t hold back an inch. Employees can sense when your holding back and not sharing. Trust them. They can handle the truth. Of course there is confidentiality. This is not what I am talking about. Stop protecting. Quit isolating staff from business news they can help with. They might even view the problems of the business as interesting new projects to tackle to grow their resumes! Use all means as possible. Some messages are tactical. Some are strategic. Some serious and some not so much. Pick your forum. Have huddles every day for daily sticks. Do a weekly discussion for businesses. Have a phone call or town hall meeting when you’re dealing with longer term updates or when you want to get some real engagement and feedback. The key is to make communication a part of your daily leadership plan. It will always take a back seat to your inbox and to do’s if you let it! Outside-In® Chronicles: Leaders, Admit When You’re Wrong Please! Today’s companies operate differently than a decade or two ago. Globalization, technology, cultural and social change, demographic trends and shifts have all impacted the way business is conducted. This structural shift has impacted the worker too. Today’s worker must be focused on knowledge building and embracing change skills to maximize themselves. However, I think this structural shift has impacted the way leaders need to lead. One of my personal pet peeves is when leaders don’t take the time to admit fault. There is this funny thing called “leadership pride” that keeps our lips shut. We may act like we did something wrong, we may make amends or attempt to fix a mistake, however, we don’t often vocally admit mistakes enough. When we don’t admit our mistakes, we damage trust on our teams and in our company. Trust is a funny thing. Easy to lose. Hard to get back. Must be built through your actions and of course, your words. They better be close to one and the same. By not admitting mistakes we look fake and disingenuous. Today’s worker must do their job on the edge of their seat and take risks in their job to create some wow (or do something Nth degree in Outside-In® language). But the risk is the key. If you won’t show vulnerability as a leader and expose yourself how do you expect others to do so? And if you expect creativity or new thinking from your people, then celebrating mistakes is a requirement. Making mistakes makes you real. By making mistakes you are human. By admitting them, you allow others to admit them and creates an open channel for improved communication to blossom. A problem said out loud, is a problem half solved! Openly addressing mistakes you’ve made as a leader allows trust to grow and build between you and your employees. It’s about being Open Book — being honest, vulnerable, and transparent – and living Outside-In® leadership, where accessibility and trust are key components of a strong leader. We all need a culture of admission, right? The Outside-In® Companies are hosting their first Talent Seminar on Thursday evening, November 21st, 2013 in Wilmington. HR professionals won’t want to miss this chance to learn and participate in group discussion about talent acquisition and how it relates to developing solutions that involve both internal and external resources. The event will kick off with a networking half hour at 5:30pm with light hors d’oeuvres and refreshments.The seminar, “Building High Efficiency Relationships with Recruitment Providers” will be taught by CBI Group’s RPO and Recruiter On-Demand Leader, Lisa Van Ess. Attendees will have a chance to ask questions following the presentation. To register for the event, go to www.outsideincompanies.com/events. The Outside-In® Companies aim to share learning and knowledge with with the HR industry and plan to host ten talent seminars in 2014. Seminar Topics will include all things related to talent, including recruitment, staffing, and outplacement. As approved HRCI presenters, the seminar on the 21st is pre-approved by HRCI for one recertification credit hour. With offices in Wilmington and Newark, the Outside-In® Companies are CBI Group, Placers, and Barton Career Advisors. The three companies provide talent solutions in recruiting, staffing, and outplacement to customers across North America. Leaders need to be teachers and trainers. As business gets bigger and more organized, training becomes a function, a department, a group of people that delivers content and curriculum that the company thinks is critical to the orientation and productivity of the employee base. However, I was taught that leaders need to focus on three key functions: Teaching, Leading and Selling. This is The Entrepreneurial Triumvirate! I just made that up, but it works. Many new leaders are confused about their role. Perhaps they were good at their job and someone thought they would be good in a leader role. Where does one begin to get good at Entrepreneurial Leadership? Well its starts with this simple premise. What do your people need in order to do their jobs? This is the essence of servant leadership. Sometimes – lots of times – they need to know things to work through how and what to do. Too many times we tell staff what to do versus show them what to do. We must learn to get out from behind our desk and work side by side. I often see and observe leaders that grow in frustration with their staff and their performance. This comes down to a simple point. A leader’s job is to develop staff. Period. End of story. Leadership begins and ends here. Too many leaders replace or complain about staff competence. This is our job, to develop competence, give feedback, create an environment of learning. To make sure learning happens on the job, in the classroom, with a buddy, on their own. I think you get the idea. Next time you see a gap as a leader will you develop the person or be frustrated? Remember, your only job is to develop people! 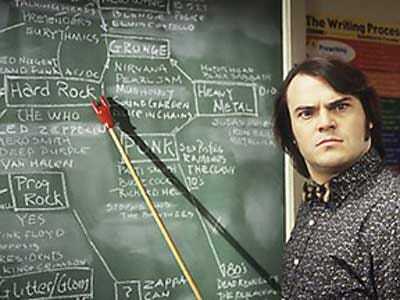 Can you be as passionate about developing employees as our friend Jack Black is about teaching future rock stars? Today’s workers have it tough. So much continues to change and there is too much new happening to fully absorb it all. For so many generations now, the western world has viewed education as the key to a better life for their kids. Education improves our quality of life, earning power and the ability to make a difference. All of us want this for our children. But there is a rude reality to all of this as of late. A college education is no longer a guarantee of anything. The numbers traditionally show that college education increases earning power over ones lifetime and also that less college graduates are unemployed than those with lesser education. But don’t ask this of recent grads. Just this week it was announced that the number of recent college graduates unemployed or underemployed is well over 50%. I can’t say that this statistic really shocked anybody. I am in the field of employment and my company certainly was not surprised. We all hear about high unemployment numbers on the evening news. Yes the economy is better, but there is a long, long way to go. I was taught by a great mentor that the key to life is to make decisions with better information. See. Think. Act. Such simple words right? Try and apply them. So many times in work, life and play we don’t gather information before we act. We hope to, but we don’t know how to gather it. So instead, we simply act and shoot from the hip. Job seekers perceive any action as progress… they send resumes, surf job boards, do Internet research — feeling “good” about their job search. Each generation grows up heavily influenced by the events and trends of the world around us and with four generations working today? Well, let’s just say it is hard to walk in each generation’s shoes, to seek to understand other generations. While I may not know exactly what you’re going through because of these differences, bear with me. Also, there are reasons why companies are not creating jobs for college grads. That is not your fault. However, you need to know what they are. Businesses add jobs when they can get a return on the investment, when they can grow and when the economic and political environment is more certain. So in the short-term over the next year or so the world is going to be extra competitive! This is not the first recession. Yes this is a bad one. But there is work if you are willing to work for it. Start in retail management if you have to. Think retail is below you? If you are a business school major, why not learn about hiring and firing, budgeting and customer growth in one of the few places that will give this responsibility to a grad. This is what I did. You are not owed anything. You have to work for it. Starting in an entry level job is not below you. Not even close. Your boss does not care about your debt or your life style. Starting at the bottom is where all of us have to start. The key is what happens next. Starting is the key. Once you have the entry-level job, take on the challenge. Ask for the tough project. Ask for the learn. Learn the business. Every business needs employees that are willing to grow themselves. While you just “finished” school, the learning has just begun. You and only you are responsible for bettering your skills and knowledge. You can’t skip steps. In baseball, you can’t score if you miss a base. In work, you cannot be VP and drive a BMW without being of real value to a business. Risk and Reward. Take the risk and get the reward right? Well, life is not always fair. Starting a company is not easy, most fail. Working for a start-up builds great skills and will broaden your exposure. But it does not make you an entrepreneur. Your first job is not the rest of your life. The first one is like your first year of college, it is to grow up in the world of work. To learn about business, clients, culture, styles of leadership. The first job is about how to fit in and find your place. And most importantly, the first job is probably more about what you do not want to do for the rest of your working career. What you do not want to do. This is the most honest advice of all. It is up to you to fit in. The workforce won’t change for you. I know you want the world your way… working from home, time off, promotions, whatever. Work is about your ability to earn and gain influence. Your influence and trust (AND your ability to get results) get you what you want. There is a gap. And you don’t even know it yet. The gap is the space between who you are today and what you are capable of. Know that employers today long for a worker who knows this and works at it closing it. Big words right? Are you now a college graduate that needs help? Do you know someone who is? Get them in contact with me. We will get them some help. Why? Good karma.